The Nigerian Maritime Administration and Safety Agency (NIMASA), is being owed about $420.5 million, by some maritime operators, the Director-General, Dr. Dakuku Peterside, has said. Peterside who made this known during an engagement with the House of Representatives Committee on Maritime Safety, Education and Administration in Abuja yesterday, also refuted claims that the Agency was owed monies in excess of $10 billion. He said it was not correct given that the freight element of shipping trade in the last four years was not up to $10billion. The Head, Corporate Communications of NIMASA, Lami Tumaka quoted Peterside as saying that the entire freight element of shipping trade in Nigeria in the last four years is less than $10billion. In response to a petition received by the Committee purporting that the Agency had engaged a consultant to assist in recovering its money without following due process, the D-G told the Committee that due process was followed in selecting the Consultant as the Bureau of Public Procurement (BPP) had also issued a Certificate of No Objection for the purpose. Dr Peterside who noted that the Agency has been making efforts to recover these monies with little success also said this necessitated the management, utilising international best practices, to employ the services of a consultant to assist in recovering the funds. 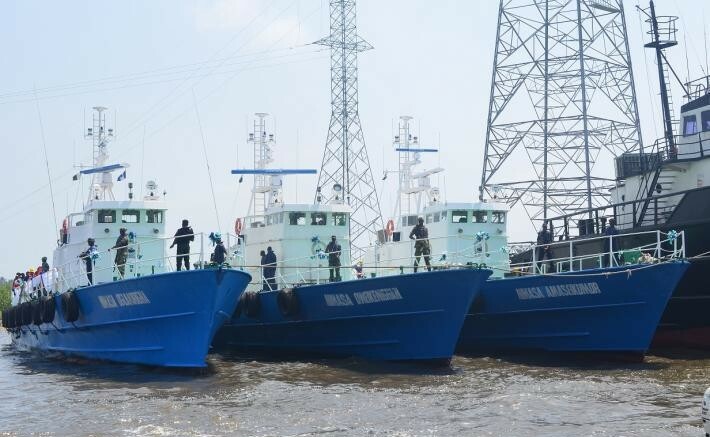 NIMASA had engaged the services of Messrs Snecou Financial Services Company Limited to assist in recovering debts owed NIMASA which are put at $420.5million with the aim of channeling the funds into developing critical infrastructure as well as knowledgeable manpower for the maritime industry. He said the debt in question covered the four year period upto 2014. Be the first to comment on "Operators Owe NIMASA $420.5m – Peterside"